Assist customers to maintain foot health by properly fitting shoes, modifying footwear for each individual and restoring shoes while providing excellent customer service. Chuck’s was located in Georgetown Square on E. State Street from 1973-97 then he moved to Stellhorn Village on Maplecrest Rd. where he is currently located. Chuck graduated from Ball State’s University orthopedic technician course in 1983 which allowed Chuck the opportunity to serve customers with shoe modification needs. After establishing a relationship with local doctors Chuck continued to expand his knowledge. He graduated from Oklahoma State University Certified Pedorthic Program in 2005. 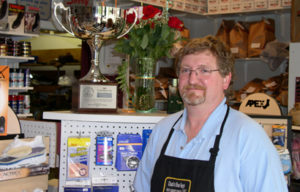 Chuck is able to make physician prescribed Orthotics and shoe modifications. He can assist customers with the correct fitting shoes and help them to make the right choice for their foot health and lifestyle. A BBB Accredited business since 04/07/1978.